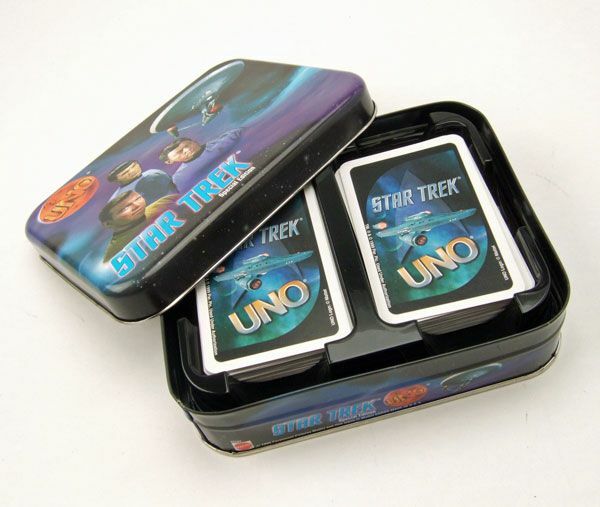 Mattel released this Star Trek version of the popular UNO game back in 1999. 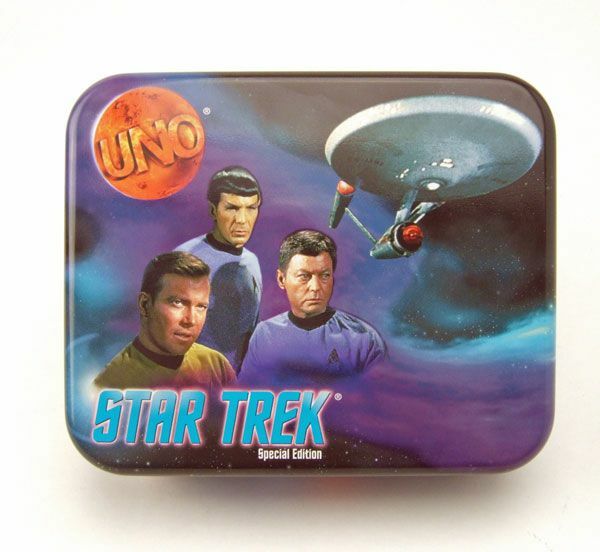 The Rundown: Awhile back, I spotlighted the 2009 release of the Star Trek UNO card game from Fundex. I felt is was a pretty solid spin on the standard UNO game, and well worth picking up. 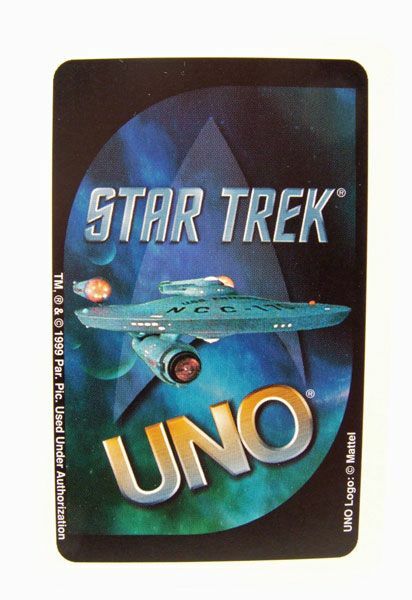 BUT... my buddy Frederick from "My Star Trek Scrapbook" reminded me of something that I had completely overlooked when writing that spotlight- There had already been a Star Trek version of UNO released years prior! How does this early version stack up to the 2009 release? Let's find out! 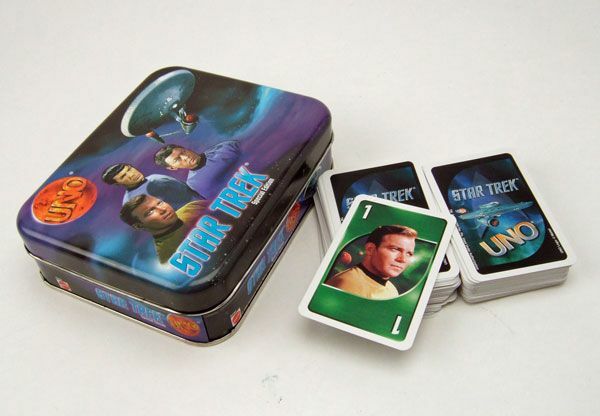 Just like the 2009 version, the game comes in an attractive tin display case. The graphic is pretty nice, and I like that this one is a bit more "subdued" than the later release. The inner tray seems to fit the cards better than the later release, with very little card slippage going on. A Klingon Bird-Of-Prey from the movies!?! How'd that get in here? Weird. 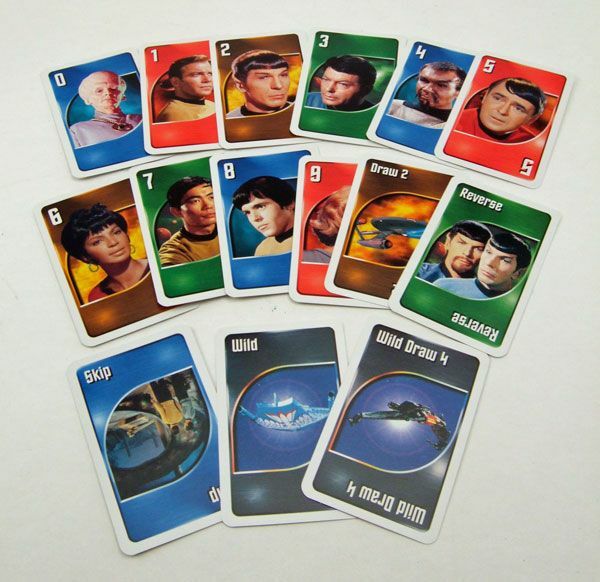 I'm going to let it go though, just for the fact that the "Reverse" card features Spock/ Mirror Spock. That alone is cool enough to excuse a couple of mistakes. 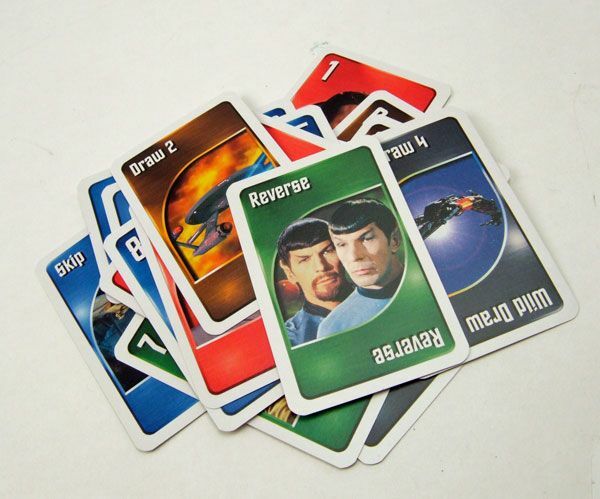 Live Long and Prosper Card- This card allows you to discard your old hand and draw an entire new one. Y'know, in case your hand stinks. 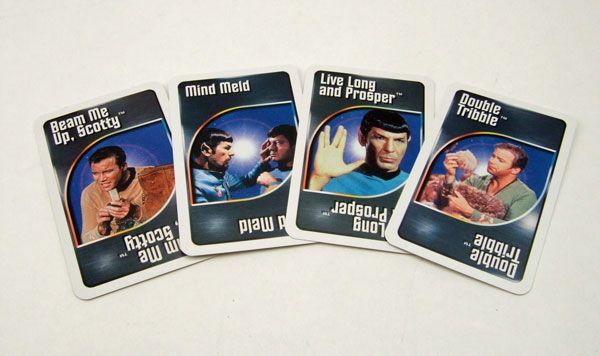 Mind Meld Card- After playing this card, you get to command another player to show his or hand to you. I REALLY like this one. We played a few hands of this the other night, and this card really turned the tide for me a couple of times. Double Tribble Card- If you play this one, the next player has to DOUBLE the amount of cards in there hand! Take that sucker! Eat them cards! Oh... and I almost forgot- Instead of just yelling "UNO!" 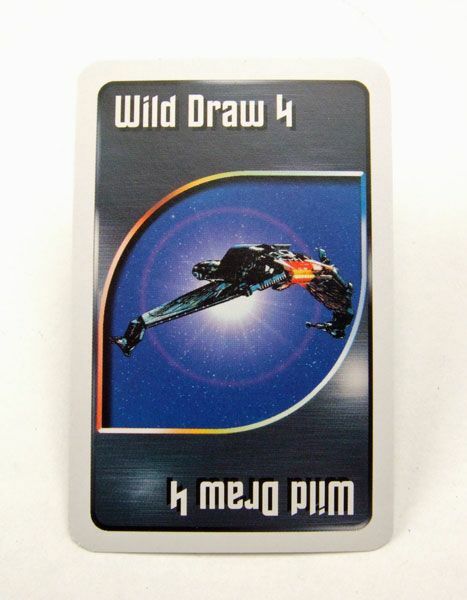 when you have one card left, you must now say "Space, the final UNO frontier!". If you don't, you have to pick up five more cards just like in regular UNO. So remember to do that. As much as I like the 2009 version, I gotta say that this version is a little better in my opinion. The 4 new cards really add to the fun of the game, which is something that the 2009 version didn't do as well (since it only featured one new ability card). It's not that I don't like the new one, I'm just saying that if you only get one, I'd go with this 1999 version. If you look around enough, you can usually snag this one for about $10-$20, which is about the same rate as its 2009 counterpart. So do some hunting around and try for this one if you can. Now you'll have to excuse me, I'm off to play another hand... Blaze owes me a rematch.